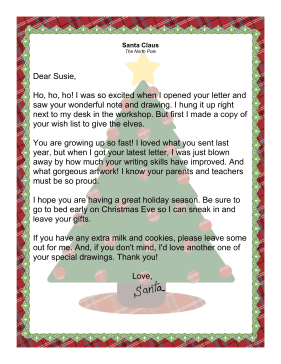 This letter from Santa is ideal when the child has already written a letter to him. It acknowledges the receipt of the letter, and the child's wish list, and includes Christmas greetings and a sly request for cookies and milk. Ho, ho, ho! I was so excited when I opened your letter and saw your wonderful note and drawing. I hung it up right next to my desk in the workshop. But first I made a copy of your wish list to give the elves. You are growing up so fast! I loved what you sent last year, but when I got your latest letter, I was just blown away by how much your writing skills have improved. And what gorgeous artwork! I know your parents and teachers must be so proud. I hope you are having a great holiday season. Be sure to go to bed early on Christmas Eve so I can sneak in and leave your gifts. If you have any extra milk and cookies, please leave some out for me. And, if you don't mind, I'd love another one of your special drawings. Thank you!